Europe’s roads present many hazards for the motorist, from the cobbled streets of Paris to the hairpin bends of the Alps, and from gravel or dirt tracks to the icy roads of a Scandinavian winter. One problem, however, seems to afflict the UK more than any other country, and that is the presence of potholes. These craters in the road surface vary in size and depth, with an average depth of four inches. 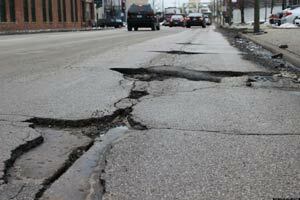 They are caused by water entering cracks in the road surface, freezing and expanding, which widens the cracks. Holes are created when heavy traffic passes over the cracked surface, breaking it up. This is why spring always seems to bring a fresh crop of potholes. Poor quality surfacing and repairs, as well as the presence of underground infrastructure, such as utility pipes and tunnels, contribute to the large numbers of potholes on our roads. Potholes are potentially dangerous, especially to cyclists and motorcyclists. A sudden change in direction caused by hitting a hole, or swerving to avoid it, can take riders into the path of another vehicle, or into an obstacle. Potholes also damage cars, in particular to tyres and wheel rims, suspension, steering, and shock absorbers. It is estimated that potholes caused £683m worth of damage to new and used cars in 2015, with the highest figures coming from the east and southeast of England, followed by London. Many drivers find that it is not worth claiming on their insurance policy, and pay for the damage themselves. It is possible to pursue the local authority responsible, though a successful claim is only likely if there is evidence that the council knew about the pothole, but had not repaired it. It is not surprising that in a survey carried out by the AA, four out of five motorists named potholes as a major concern. The motor trade is paying attention to the problem. In Lommel, Belgium, Fords on trade plates are driven 24 hours a day around a gruelling test track, the equivalent of a decade’s worth of hard driving. Pothole damage can be so ruinous that Ford has devoted a section of the track, an amalgam of the world’s most challenging surfaces, to a reproduction of pothole ridden Essex roads. Most potholes are the responsibility of the local authority, which is responsible for the upkeep of urban and country roads. The Highways Agency takes care of motorways and trunk roads. Potholes can be reported online through gov.uk and several independent websites. This entry was posted in News on June 20, 2016 by Lee.Middleton.